Thermtronix® Aluminum Porosity Measurement Systems boast breakthrough technology that provides precise, scientific, repeatable, and verifiable test results every time. All measuring systems including RATS™ Model 401 and the Q-Series units significantly aid in producing quality cast aluminum products. If quality is your goal, then having a Thermtronix® aluminum porosity measurement system on your shop floor is a necessity. Integral Reduced Atmosphere Testing System (RATS), provides cost effective shop floor degassing and sample testing in a single unit. Model 401 is a compact table top control system used for fast, accurate, repeatable and consistent testing of hydrogen gas levels in molten aluminum. This rugged, foundry proven unit can be placed within a few feet of melting operations for continuous quality level monitoring. 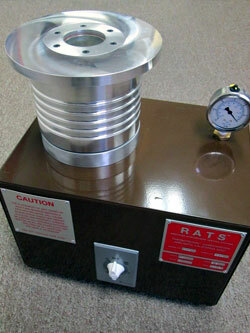 RATS™ permits a simple, highly accurate, automatically timed five minute test that can be performed by shop personnel and assures consistent quality levels before the metal is cast. 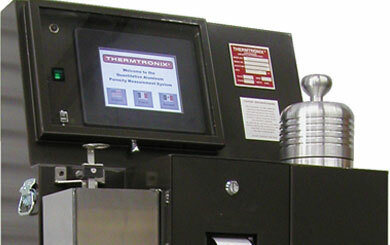 Thermtronix® Q-Series Quantitative Aluminum Porosity Measurement System is a computerized testing device that digitally measures, displays and records, in real time, the precise level of hydrogen porosity in a sample of molten aluminum. 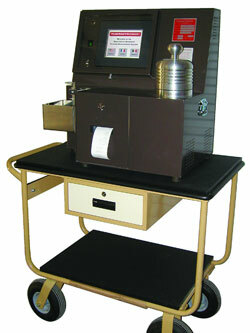 This breakthrough technology provides precise, scientific, repeatable, quantitative and verifiable test results. Computerized, digital, measurements are converted to an exact percentage of aluminum porosity. The digital Q-Series Quantitative Aluminum Porosity Measuring System is complete with a certificate of calibration traceable to the U.S. Bureau of Standards. Unique stainless steel scale fixture allows for the sample weight to be measured in free air and completely submersed in water without reconfiguration.